To keep improving efficiency on English pig units, the industry must keep right up-to-date with new ideas from both home and abroad, including investigating the pros and cons of new buildings and technologies. Our most recent BPEX producer tour to France illuminated how building investments can be both fit for purpose and cost-effective. The three-day trip to Brittany, which we led jointly with BOCM PAULS, got producers thinking about making changes to ventilation systems, a possible move to a slatted system and improvements to weaner and grower accommodation. 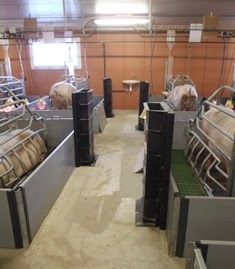 One of the highlights was a cost-effective concept building from a French manufacturer, which can be adapted as accommodation for farrowing, dry sows, weaners and more. There’s nothing quite like seeing other pig units first hand and having the chance to question the producers and engineers involved, to work out whether a technology could be suitable, or adapted, to help improve pig production on an English unit. Please get in touch with me if you'd like to know more about the trip or about ideas for future knowledge-gathering tours.